The first issue of Inc. magazine was published in 1979 in Boston and since then its reputation in the business community grows and becomes stronger. In 1981, Inc. became the first magazine that published Steve Jobs on the cover and even then editors knew: "This man changed business forever." The TOP 5000 of the fastest-growing companies was first published in 1982 and it's big honor to be in this list. Visiting the award ceremony means to be equal among the most successful businessmen in the world. Beginning from 2015 TOP 5000 is not limited to American companies and made the same list for European companies. The first winners were announced on the website in February and XOtel hit the number! 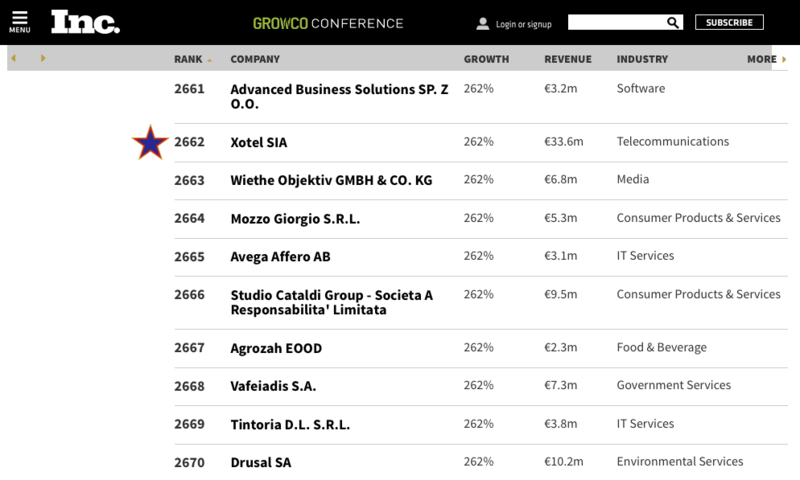 We took 2662 place with 262% growth and € 33,6 MM income. Earlier XOtel had an honor to be among the TOP 500 and the TOP 200 Latvian company according to Dienas Bizness. Nowadays XOtel holds the position of the 5th largest telecom in Latvia, and is the 1st among alternative telecom operators! To cap it all, it's a great incentive for our team to work even harder and achieve even more impressive results. We do hope our partners will share our joy of this achievement! And no need to say that we're always looking for new meetings, communication and cooperation.